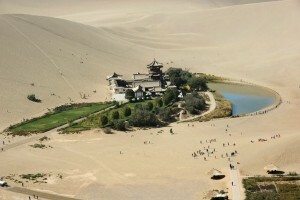 Located in the north-west of China, between the Tibetan and Huangtu plateaus, Gansu connects the Chinese heartland with the vast desert region to the Northwest. Covering a total area of around 450,000km, roughly the size of Sweden, Gansu borders 7 different countries and provinces including Mongolia, Inner Mongolia, Ningxia, Xinjiang, Qinghai, Sichuan, and Shaanxi. Gansu province has a population of roughly 30 million people, over 70% of which are still engaged in farming. Almost 92% of the population is Han Chinese with the rest being made up of Hui, Tibetan, Dongxiang, Tu, Manchu, Uyghur, Yugur, Bonan, Mongolian, Salar, and Kazakh minorities. 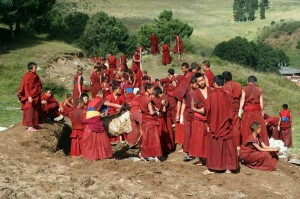 This rich mix of people means that the province abounds with mosques, monasteries and Chinese temples. 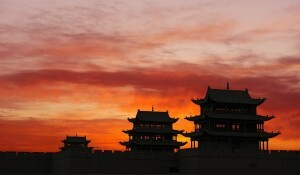 Gansu had a nominal 2011 GDP of around $79 billion and a GDP per capita of only $1,879. It is one of the poorest provinces in China. Recent growth in the local economy has been driven primarily by the expansion of mining and heavy industry. Gansu has significant deposits of minerals including many rare earth elements. Other significant deposits include potassium, chromium, coal, iron, lead, crude oil, platinum, tungsten, lithium, and zinc as well as massive deposits of nickel; over 90% of China’s nickel deposits can be found in Gansu. Modern industrial development in Gansu did not begin until after the railroad through the Hexi Corridor was completed in the mid-1950s. 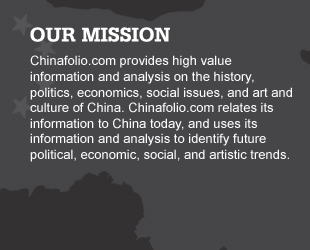 It was Mao’s idea to transform the province into a center of heavy industry with Lanzhou; Mao believed that by dispersing his manufacturing bases in western China, he would better be able to defend them in the case of enemy attack. Besides mining, Gansu today engages in electricity generation, petrochemical extraction and refining, oil exploration machinery, building material production, locomotive equipment, chemical fertilizers, and petrochemicals. In China’s 2011-2015 12th Five Year Plan, plans were laid out to grow the province’s economy 10% annually by focusing investments on: renewable energy- including hydropower, solar and wind- coal, chemicals, nonferrous metals, pharmaceuticals and services. Gansu’s growing reliance on heavy industry has led to a spike in pollution levels. Lanzhou, for example, is the most polluted city in China today with heavy industry, petro-chemical factories and brick kilns contributing to the smoke and air- borne chemicals that are said to be double that of Beijing. Agriculture is also a significant contributor to Gansu’s economy. Crops farmed in Gansu include cotton, linseed oil, maize, melons, wheat, tubers, sugar beets, rapeseed, soybeans, a variety of fruits, and a vast array of Chinese medicinal herbs. However, the majority of produce in Gansu is grains, with annual grain outputs at around 8 million tons. Historically, Gansu struggled to produce enough grain to feed itself. It has only been with increased irrigation, mechanization, the introduction of chemical fertilizers, the collection and storage of rain runoff and mulching with plastic film, that the province’s agricultural output risen sufficiently enough to meet its population’s basic needs, but total agricultural productivity still remains below that of many other provinces. The fertile Hexi Corridor produces most of the province’s food crops. Attempts are currently being made to transform the historically barren land around the Hexi Corridor into cotton fields with improved irrigation techniques. It is estimated that as much as one-third of this area may be suitable for cotton. Wool and tobacco are produced as cash crops. Gansu also raises large herds of livestock, about half of which are. It also raises two-humped camels. Tourism is also a huge contributor to the economy. Because Gansu is bordered by two plateaus, it is an elevated area, with an average elevation of over 1000m above sea level. The Yellow River not only flows through the south of Gansu, but it gets much water from sources within the province. The River has allowed Gansu to be settled since pre-historic times. Away from the Yellow River and its irrigation and various oases, Gansu is an arid, barren land, with warm to hot summers, and very cold winters. 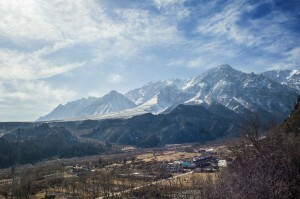 In some areas, Gansu becomes subarctic, with temperatures dropping to -40 degrees Celsius during the winter. Through the centre of Gansu runs the Hexi Corridor, a 1200 km corridor dotted with oases. Forming part of the ancient northern Silk Road, for centuries the Hexi Corridor was the most important route from China to Central Asia. The corridor follows oases down along the northern edge of the Tibetan Plateau. 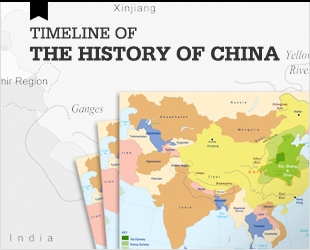 As the Chinese empire expanded up the corridor during the Han Dynasty (202 BCE-261 CE), so too followed China’s Great Wall, and later, the province’s first railway. 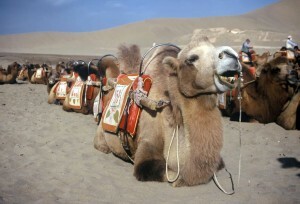 Gansu’s location as a key thoroughfare for the Silk Road made the province historically very important to China. As the silk trade grew, so did the trading posts along the Hexi corridor; many of these form the major population centres of Gansu today. Located on the south bank of the Yellow River, Lanzhou is the province’s capital. Over the centuries, its population has been supported by excellent farming land situated nearby. 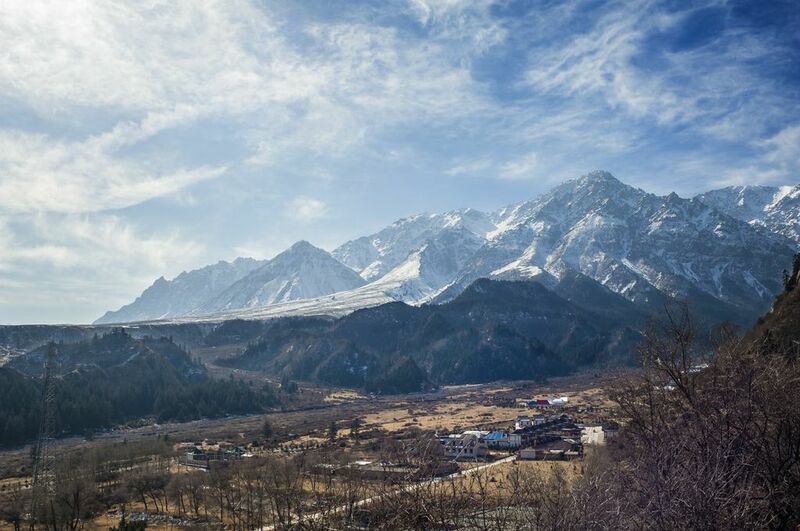 To the south of the Hexi corridor lies the snow-capped Qilian Mountains, with the highest peak in the province reaching 5547m above sea level. To the north are the flat grasslands of Outer Mongolia and the Gobi Desert. Desertification is a serious issue throughout the province. Gansu sees little rain, and can be plagued by dust storms in the spring. China is currently working in conjunction with the Asian Development Bank on what has been called the Silk Road Ecosystem Restoration Project whose aim is to reverse desertification in the province. Earthquakes are another challenge for the area. Gansu experiences tectonic activity caused by the movements along the Eurasian and Indian Plates. The eastern part of Gansu has been hit by major earthquakes which have taken place on average every 65 years since the 6th century, while minor earthquakes plague the province once every 10 years. In 1920, for instance, an 8.5 magnitude earthquake killed over 200,000 people, many of whom died from resulting landslides which overwhelmed many towns. Lanzhou, the province’s capital, is located at the cartographic heart of China and hosts the Ganu Provincial Museum. Buddhism arrived in China over the Silk Road, and the sculptures at Bingling Si were one of the first Buddhist monuments to be created in China. 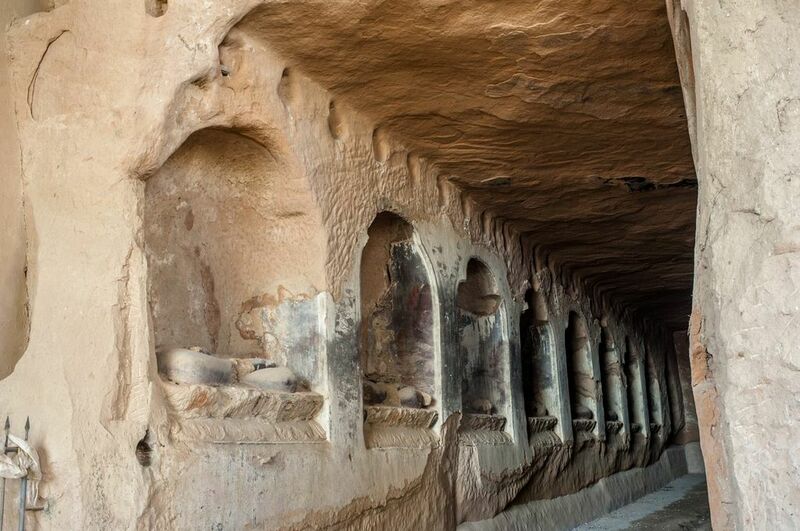 Known as the Thousand Buddha Caves, they were carved over a period of 1600 years by sculptors hanging from ropes paid by wealthy Silk Road traders heading west. Isolated by the waters of the Yellow River – which saved them from destruction during the Cultural Revolution –reaching them requires boat travel. Xiahe is an important Tibetan Monastery town that still sees Buddhist pilgrims flock to its beautiful, spiritual Labrang Monastery founded in 1709. The monastery is one of the six major Tibetan monasteries of the Yellow Hat Sect of Tibetan Buddhism. Langmusi is a remote mountain town set in beautiful country. It boasts beautiful walking trails and dotted with several Buddhist temples. Jiayuguan was considered China’s final outpost before the desert, and still houses the ancient Jiayuguan Fort and the Great Wall Museum which tells the story of the Wall from the Han to Ming Dynasties. The Dunhuang Oasis is a small oasis town that prospered during the Silk Road; surrounding it are forts, towers and cave temples as well as magnificent sand dunes. The Dunhuang cave paintings are some of the best Buddhist paintings in China. A half hour by car from Dunhuang are the Mogao caves which also hold some of the best Buddhist paintings in China, if not in the world, and are a UNESCO World Heritage site. Singing Sand Mountain and Crescent Moon Lake also attract many visitors due to their breath-taking scenery.